Over this weekend I've done a tonne of needless trawling through eBay in order to avoid doing uni work. 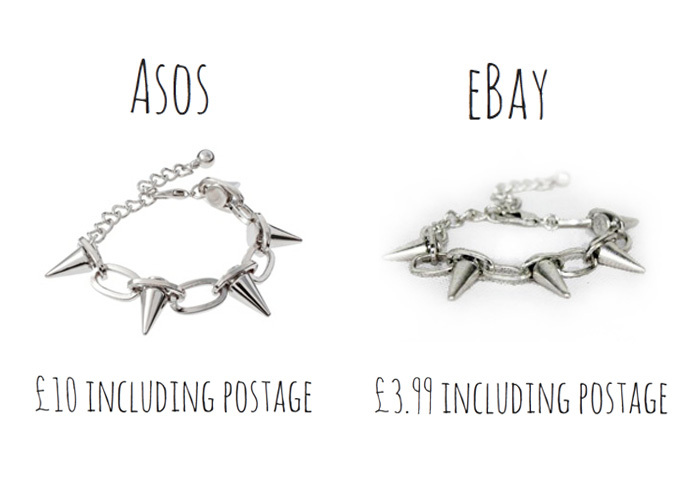 Yesterday I came across this bracelet on eBay, I wasn't actually searching for a dupe of the spiked ASOS bracelet at the time, I was looking for an ear cuff similar to the ones at Regal Rose. If you read my blog regularly, your bound to know that I can't resist a good dupe / bargain / lookalikey product! I love sharing what I find with you guys and I hope you like this find too. Seeing as I've been hankering after the ASOS original of this bracelet for over a month now, as soon as I happened to cross paths with this cheaper alternative I had to get it! The only difference seems to be in the colours. The eBay bracelet has an antique finish on both the gold and silver versions, there's a black bracelet too, which seems to be a kind of matte material. 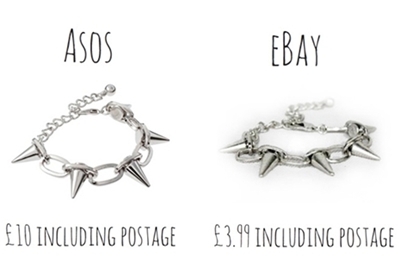 Whereas the ASOS bracelet looks like a polished silver coloured metal, as you can see here. I'm 80% sure there was a gold version of this bracelet on ASOS too, but I can't seem to find it! The ASOS version is £10, free delivery is offered my ASOS on all orders too. The eBay version (available in 3 colours) is £2.99, postage is an extra £1. That's £3.99 in total, 60% less than ASOS! It's also from a UK seller with 100% positive feedback. I ordered myself the silver coloured bracelet from eBay yesterday. I'll let you know about the quality and such when it arrives! By the way I'm currently running a giveaway! It's really quick to enter and just 15 bloggers have entered so far (thank you if you're reading this :)! ), meaning the odds of winning are pretty good at the moment! I've tried to be as generous as possible, so please click the link and check it out. Brilliant find! Well done you! I think you did the right thing ordering from ebay! Wow!! beautiful photos Robyngger! Please check out my blog too, I would be so happy if you could follow me back with Google Friend Connect! Ebay is really cool sometimes! want want want!! Am I too late?